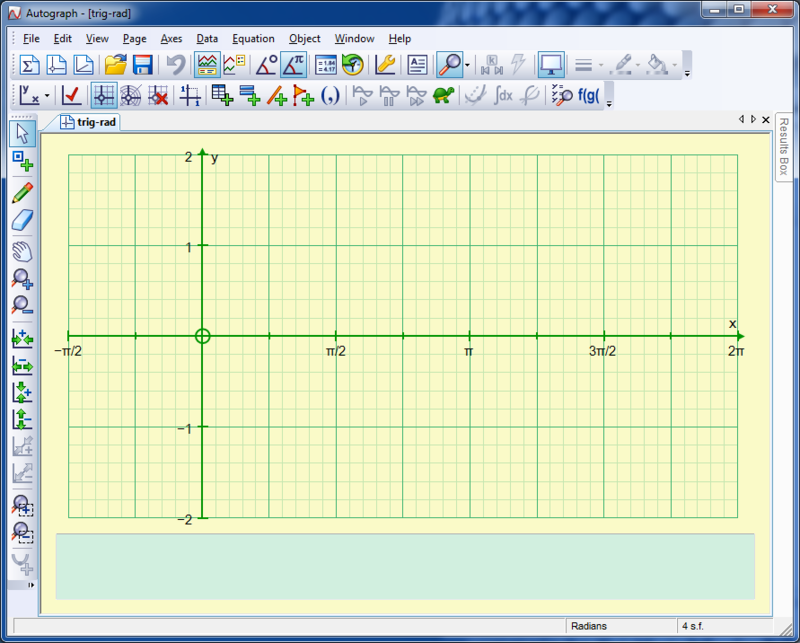 “I am drawing some quadratic functions to get some graphs for a flipchart. I go to Axes => Edit Axes, and set my Ranges. Autograph seems happy with my range, but it doesn’t seem to like my domain, so it changes it. eg I chose an x-range from -3 to 5, but Autograph gives me a range of -7 to 18. ‘Equal Aspect’ is a mode in Autograph, ensuring that the x- and y- scales are the same. 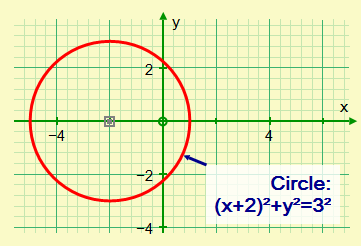 When it is ON, the line y=x will always be at 45° and a circle will always be circular, regardless of the aspect of the graphing window. Autograph achieves an equal aspect by adjusting the ‘x’ scale to fit the ‘y’ scale. So when it is ON, in ‘Edit Axes’ there is not much point in entering values for ‘x’, though the domain entered will have an influence on the positioning of the origin. ‘Equal Aspect’ is ON by default in the Standard Level. 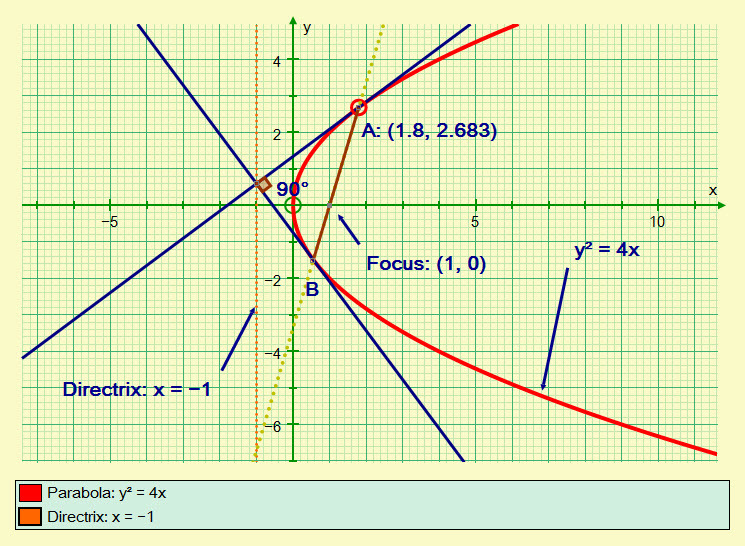 Illustrated here is a quadratic graph with ‘Equal Aspect’ ON and OFF, but with the same ‘y’-range. Also drawn is a tangent and normal at x = 2, and a circle centre (2,2) and radus 4. To obtain this screenshot I had just two pages open and used the feature Window => ‘Tile Vertical’. Why is the Javelin not thrown at 45°? The best way to explore this is to use paramteric equations. First make sure you are set to DEGREES (not radians), and in 2D, enter x = (vcosb)t, y = h + (vsinb)t − ½gt² with startup options on “Manual”, with ‘t’ from 0 to 8 (sec), step 0.01. Set the constants to: ‘v’ = 10 (m/s), ‘b’ = 45 (°). h = 1.8 (m), g = 9.81 (m/s²). 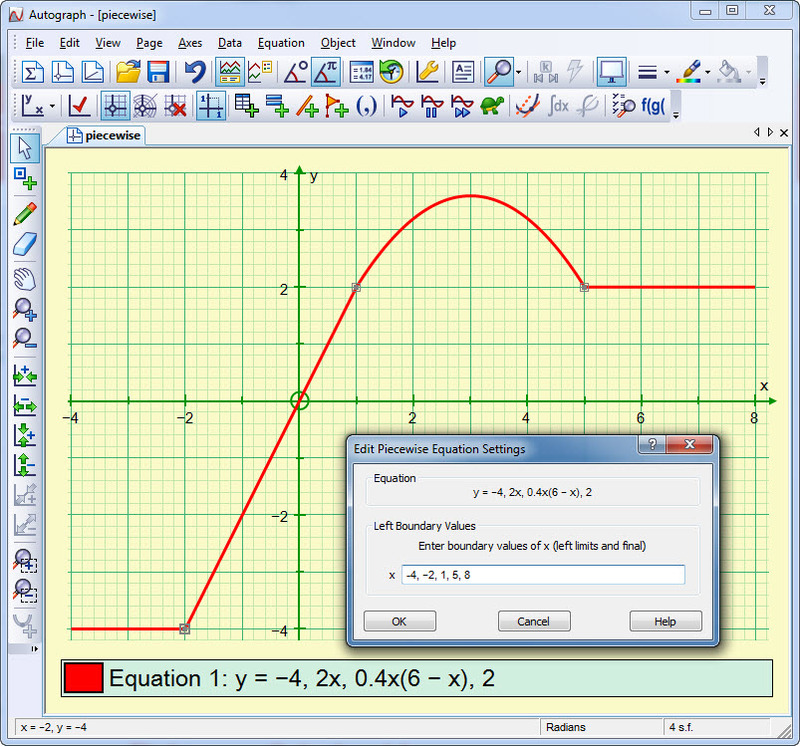 After plotting, select the curve and right-click “enter point on curve” at t = 0, with t-snap = 0.1, and plot teh Velocity Vector. For 3D, enter x = (vcosb)(cosa)t, y =(vcosb)(sina)t, z=h+(vsinb)t − ½gt² where ‘b’ is the angle to the horizontal (as in 2D), and ‘a’ is the angle round from the ‘x’ axis. Proceed as with 2D to place a point at t = 0 and a velocity vector. Draw the plane z = 0 to represent the ground, and a number of circles on the grass using the form x = 10cost, y = 10sint, z = 0. To investigate, either in 2D or 3D, note that the maximum orizontal range ooccuras at 45°, whereas the maximum range on the ground occurs around 39°. This analysis assumes that the javelin can be thrown at the same speed at all angles, which is clearly not the case. You can show that the range is much more affected by the initial velocity of throw than by the angle. Research elswhere suggests that the physiology of the human arm allows the maximum speed of projection at around 31°, which is the angle that most javelin throwers use. Oh dear – an elliptical circle! When connected to a data projector, have you ever found that your circles are elliptical, even though you have “Equal Aspect” clicked on in Autograph? Most wide-screen laptops are 16:10 aspect, and switch automatically to 4:3 (using 1024 x 768) when connected to a data projector. The problem illustrated here arises with more modern projectors that can handle wide-screen, but usually to the ‘TV’ standard 16:9. The laptop is likely to be in 1280 x 800 (16:10). The solution is to change your laptop (if you can!!) to 1280 x 720 (16:9). Older graphics cards will not offer this, in which case you should switch the projector to 4:3 aspect.